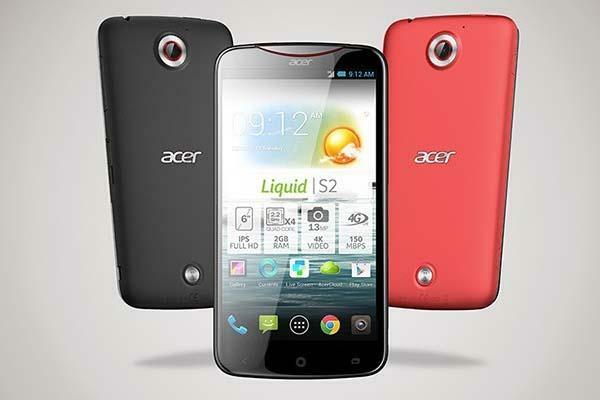 Acer Liquid S2 is a 6-inch Android smartphone that measures 166 x 86 x 8.99mm. The smartphone runs on Google Android 4.2.2 Jelly Bean mobile operating system, and features a 13-megapixel autofocus camera with f2.2,28mm lens, BSI sensor, LED ring flash and 4K video recording capability. Moreover, the Android phone comes with a 2.2GHz quad-core processor, 2GB RAM, 16GB internal storage, 6-inch full HD display with IPS and 1920 x 1080 pixels resolution, 2-megapixel front-facing camera with f2.2, 24mm lens, BSI sensor and 1080p video recording capability. Apart from that, other specs include WiFi, Bluetooth 4.0, NFC, GPS+GLONASS, and non-replaceable 3300mAh rechargeable battery. Acer Liquid S2 Android phone will be available at the end of October, and the pricing will be announced soon.